Prop. 6: Commensurable magnitudes incline-equally when they have the same ratio for their lengths inversely as their weights. Prop. 7: And then even if the magnitudes are incommensurable, they will similarly incline-equally when they have the same ratio from their lengths inversely as their magnitudes. 6. Commensurable magnitudes incline-equally when they have the same ratio for their lengths inversely as their weights. (diagram 1) Let there be commensurable magnitudes A, B whose centers are A, B and let there be a length ED, and let it be as A is to B so is length DG to length GE. 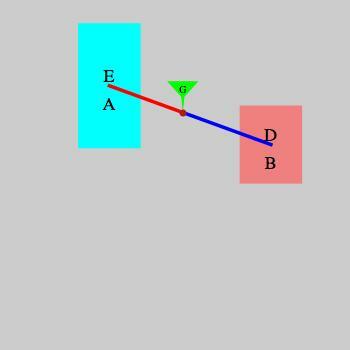 (diagram 2) One must prove that when A, B are put together on each side, the center of weight is G.
(*1*) It is crucial that the magnitudes have the same configuration as in one of I prop. 4, prop. 5, corollary 1, or corollary 2. Only then can one apply Assumption 6. It is a reasonable question whether the proof requires that the centers of weight of every object suspended from the beam be on the beam. Elsewhere in Archimedes, this is explicitly not the case (Quadrature of the Parabola props. 6-15). However, Equilibria of Planes is concerned only with findng properties of centers of weight. So one might conceive the argument as setting up the line EH and showing where the center of weight of areas A and B and then, only at the end, do we actually place the weights on the line, with the centers at E and H. Heiberg's own diagram suggests this interpretation. 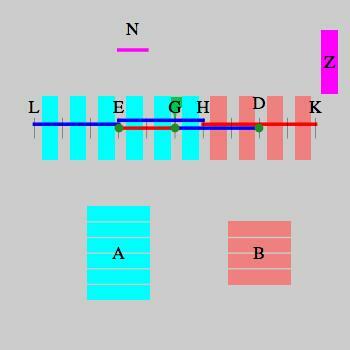 Note that it is assumed that we can place each weight on the line (beam) with its center of weight at any desired point. It makes no difference for the assumptions 1-4, 7 whether the center of weight is on the perpendicular to the horizon going through the balance beam at a or is on the beam at point a.
Archimedes alludes to a proof of this in Quadrature of the Parabola 6. (*2*) The number of weights is even because N measures EG and DG, but B : Z = KH : N = 2*DG : N, so that also A : Z = LH : N = 2*GD : N.
If A and B are commensurable and placed at E and D with lengths from G, such that A : B > EG : DG, then they will incline to A. 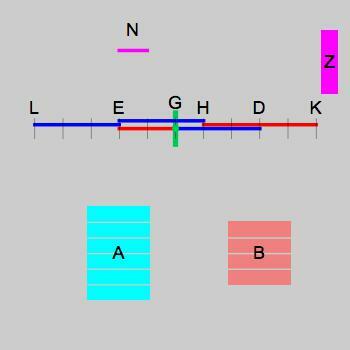 (diagram 1) Suppose that they do not incline to A and that A : B > EG : DG. If they incline equally, then A : B = EG : DG, contrary to the hypothesis. So they incline to B. (diagram 2) If EG is commensurable with DG, add to A an amount X such that AX inclines equally with B. Hence, AX : B = EG : DG. But A : B > EG : DG, so that A : B > AX : B. Hence AX < A. (diagram 2) Suppose that EG, DG are not commensurable (here things get not a little messy and may need to mimic some of I Prop. 7, cf. introductory note 3). Again, A : B > EG : DG. (diagram 3) So pick a point P such that A : B > EP : PD > EG : DG, but where EP is commensurable with PD. Then AB incline towards A by the previous proof. A fortiori, it will incline when the we take G as the balance point. Notes: this proof assumes that the inclination relation corresponds to a monotonic function. There is nothing to indicate that something may incline in one direction when the distances are commensurable and in the opposite direction when incommensurable. It is a natural assumption, of course, but one that needs to be made explicit. Again, see introductory note 3. 7. And then even if the magnitudes are incommensurable, they will similarly incline-equally when they have the same ratio from their lengths inversely as their magnitudes. On this theorem and the history of Greek proportion theory, cf. W.R. Knorr, “Archimedes and the Pre-Euclidean Proportion Theory,” Archives internationales d'histoire des sciences 28 (1978), 183-244, Bernard Vitrac, Euclide, Les Éléments: Livres V à IX, vol. 2 (Paris, 1994), and H. Mendell, “Two Traces of Two-Step Eudoxan Proportion Theory in Aristotle: A Tale of Definitions in Aristotle, With a Moral,” Archive for History of the Exact Sciences 61 (2007): 3-37. It is necessary to hear in this expression, not that G is larger in every way than AB, but that it is supposed larger than according to equal-inclination. For it is possible that even a smaller magnitude have a larger inclination because the length of the balance is much larger and makes the ratio unequal. It is necessary, he says, to take away some magnitude, B, from magnitude AB, that makes a remainder, A, commensurate with G and A larger than according to an equal inclination with G. It is possible to do this through what was stated at the beginning of the tenth book of Euclid�s Elements and in the third of the Sphaerics of Theodosius. It is unclear which texts in either work Eutocius refers to, unless he means in the first case that one could prove the lemma from Elements X 1-10 and that it is presupposed by the theorems in Sphaerics III or thinks that a scholion Spherics III 9 is part of the text. For the lemma, cf. scholion to Theodosius, Sphaerica iii 9. Cf. W.R. Knorr, “Archimedes and the Pre-Euclidean Proportion Theory,” Archives internationales d'histoire des sciences 28 (1978), 183-244. The proof is incomplete and problematic. Here is an outline, with R(A,a) the inclination of A at length a, R(A,a) = R(B,b) as A and B equally incline at lengths a and b, and R(A,a) > R(B,b), A and B incline towards A at lengths a and b. Commensurable(A,B) means that A and B are commensurable. and G was taken so that R(A,ZE) > R(G,ED), which is impossible. diagram 1) Take the setup of I 6 with E the center of weight of A and D the center of weight of B, and G the center of weight of A+B, so that R(A,EG) = R(B,DG). Let the weights on GL be C. Recall that tC = the weights on GK so that R(C, LG/2) = R(weights GK, GK/2). Let PG = GK/2, so that P is the center of weight of C and let Q be the center of weight of the weights on GH = A-C, i.e., where GQ = GH/2. 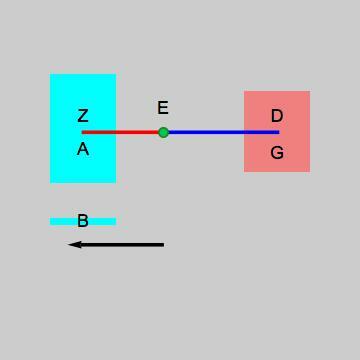 (diagram 2) Now, move the center of weight of B to R, so that RG > GD. Then, since C and A are commensurable with B, so are the weights on GH. 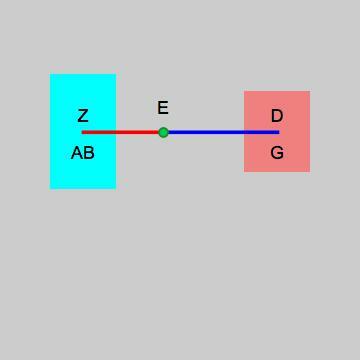 Hence, the center of weight of the weights on GH+B at R will be some point S such that B : A-C = QS : SR. It is easy to see that SQ > DQ, or rather that SG > DG. Since C = A-C+B (from the original setup of I 7), it follows by I post. 1 that R(B+A-C,SG) > R(C,GP). But this arrangment is the same as R(A,EG) and R(B,GR). Hence, R(B,GR) > R(A,EG).